I’ve had my eye on Elizabeth Ridge since first noticing it two years ago during an activation of nearby Tolmie Peak (W7W/RS-035). This 5,500′ summit rises sharply just across the road from the trail head one takes to Tolmie Peak. Starting at the road in front of Mowich Lake, the summit is only 500′ vertically, but this is over a distance of 0.3 to 0.4 miles. This could be a short (but not necessarily quick and easy) hike during the summer after doing Tolmie Peak. A winter or spring activation adds 4.5 miles (each way) and 1200′ of elevation because the road is closed and snow covered. One must snowshoe or cross-country ski to the lake from the gated road beginning at the Paul Peak trail head parking lot. Hiking to the summit itself is an adventure, as there are no established or informal trails, and little information from the hiking community. The treed summit offers few views, but has plenty of good operating spots and tall trees for antennas. Getting to the trail head is not difficult. Head toward Buckley, Washington on Highway 410 from either direction. One possibility is to follow signs for Hwy 165, but here is an algorithm that is easy and adds only a few seconds to the trip. Ignore the Hwy 165 signs and turn onto Mundy Loss Road—right if you are coming from Bonnie Lake or left if you are coming from Enumclaw. Mundy Loss Road ends at WA 165…turn left. The highway goes through Burnett, Wilkeson, and Carbonado, and starts ascending above the Carbon River valley. You will cross a one-lane bridge. Shortly after the bridge, the road forks. Stay right (really, straight). The left road goes to the Carbon River station. The straight fork goes to Mowich Lake. Mt. 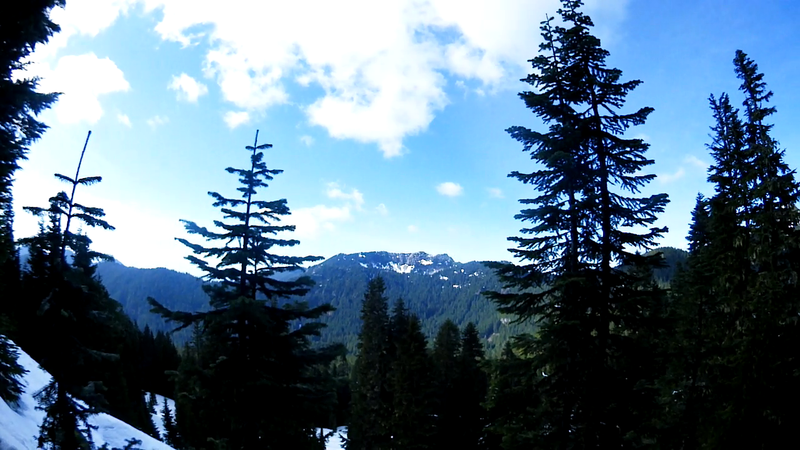 Rainier National Park is 11 miles past the fork. The road goes from paved to gravel. Sometimes the gravel road has severe washboarding. Sometimes the gravel road has many sections with nasty potholes, as was the case in early 2016 until the road was fixed sometime in May. The Paul Peak trail head and parking lot is a short distance past the park entrance. A National Park pass is required. In the summer and fall, you can drive right to Mowich Lake and park. For winter and spring activations, the Paul Peak trail is as far as you can go in a motor vehicle. Peakbaggers only has two reports of successful summits, each within the past two years. Brian Kraii wrote up a nice report of his trip along with a short video and numerous pictures. The route Brian and other people seem to use in the winter or spring is to hike the Paul Peak trail, and then hike/snowshoe off trail northeast up the ridge to Paul peak, descend to the saddle and up the southwest ridge to the top of Elizabeth Ridge. The return trip takes one down the northeast side of the ridge toward Mowich Lake followed by a ~5 mile road hike back to the parking lot at the Paul Peak trailhead. That round trip is probably 10 miles and on the order of 2000′ of elevation gain. This is the route I first attempted with my hiking buddy Chris on 31 Mar 2016. Chris and I got a late start, in part, because Mowich Lake road was in horrible shape then. On top of that, we were confused about where the Paul Peak trail began. We thought it began some distance after the gate. It actually was right at the gate, off the parking area with the restrooms. He were on the Paul Peak trail by noon and followed it around to the southwest ridge of Paul Peak and began a cross-country bushwhack up the ridge line. Going was easy at first, but as the terrain got steeper we came across many blow-downs. On top of that, the ground was wet with snow patches making things slippery but without enough snow to use snowshoes. We reached Paul Peak shortly after 3pm, which did not leave us enough time to continue on to Elizabeth Ridge and avoid hiking in the dark. The lesson: If you take this route…get an early start. A month later, on April 30th, I returned for a solo attempt at Elizabeth Ridge. 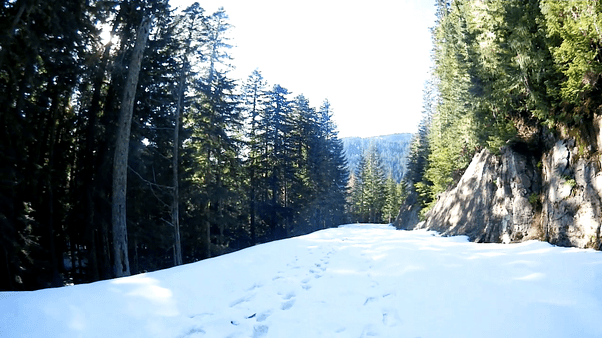 My intention was to bike the road from the gate until I ran into snow, and then hike or snowshoe to Mowich Lake and ascend Elizabeth Ridge out of the northeast. When I arrived at the Paul Peak parking area, my bicycle had a flat tire, so I walked the 5 mile road to Mowich Lake, saving 1/2 mile taking a trail that cut the road switchback. It turns out the bicycle would have been minimally useful. After 1/2 mile the road was snow covered and remained that way to the lake. I hiked well past the point that snowshoes would have been useful and then put on the snowshoes. 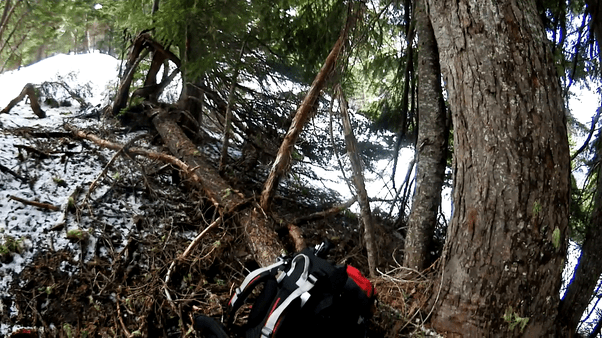 When I got near Mowich Lake, I spotted a narrow snowfield headed up the side of the ridge. 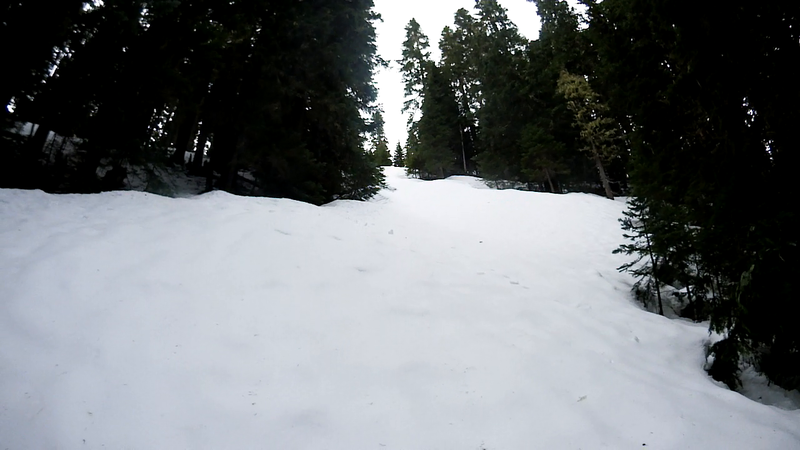 It was steep and covered with 2-4 feet of snow (based on the well-defined tree wells). It looked to rise about 400′ to within 100′ of the summit. I decided to ascend this snow field rather than attempting the ridge-line with its many trees, unknown obstacles, and snow bridges between the tree wells. Once I gained the ridge, travel was precarious in a few places because I had to carefully traverse snow bridges between tree wells. But generally, the going was not too difficult. At the edge of the activation zone was a rock outcropping that gave a nice view of Tolmie Peak. The lookout is visible on the left above a small patch of snow; the true summit is to the right. For my activation, I found a snow-free area in a ring of trees about 25′ below the summit shortly after 2200Z. I was about an hour past my posted activation time. Several people (N7QOZ, N7EHP, N7EPD) were waiting for me on 146.52 MHz. I was able to work N7EPD and K7ND on 1296 MHz FM using a one-watt hand-held and PC board yagi. N7EPD also worked me on 900 MHz using another hand-held and another PC board yagi. A snow-free patch for the activation. Since this was a joint SOTA and NPOTA activation, I kept something of a pile-up going on 20m CW from about 2300Z to 2330Z, resulting in 34 QSOs. After that, I called CQ on 40m CW for awhile with no takers before I decided to pack up. I explored the summit a bit before heading back just before 0000Z. It took only a few minutes to reach the snowfield, and then I glissaded down the snowfield, first on my snowshoes, and then on my back. I reached the road well within 10 minutes of leaving the summit! The rest of the walk was another 75 minutes down the road with one shortcut through the forest. I made it back home to Redmond before dusk. Hi, Nice write-up on your trip today. I had a contact with you while you were up there, I’m the one with the Scottish accent. I was mobile heading home to Cannon Beach from my monthly-ish trip to the Bellevue head office, I was about 6 miles north of Olympia at the time. I keep the radio on in the car for the trip, but I’m mostly an HF CW op. It was nice to make the contact just before I went out of your range. Good luck for future hikes/activation’s. Thanks for the QSO! I also mostly operate HF CW from SOTA summits, but it is always fun to work local folks. I try to do microwave stuff (900 MHz and 1296 MHz) as well, just to give people something to do with their microwave equipment on non-contest days.